This hotel, The Beverly Hills Hotel, has special significance to me. It was first pointed out to me by my Uncle. He told me that my Grandma and Grandpa used to stay here years back when they would visit him in Los Angeles. My uncle moved from New York City to L.A. when he was in his 20’s. I also moved from the east coast to the west coast in my 20’s. In numerous ways my life parallels that of my relatives even though I have not intentionally followed in their footsteps. 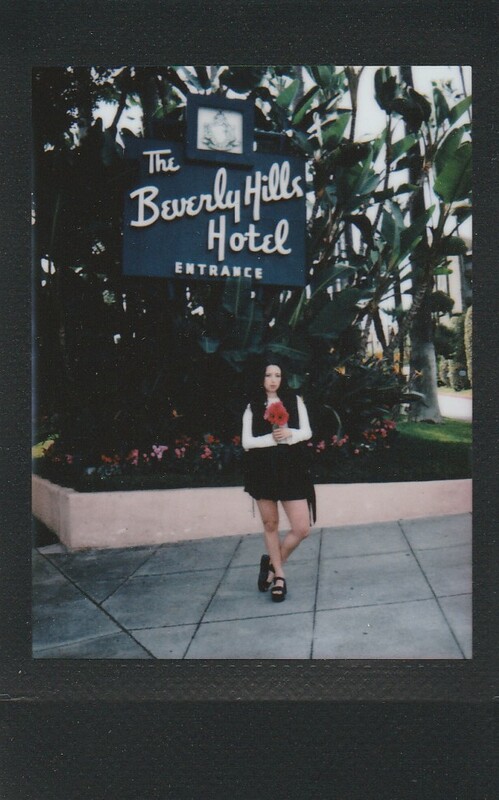 The Beverly Hills Hotel is a landmark and a hugely popular place for bloggers, influencers, celebrities, tourists and the like to capture the perfect photograph in front of it’s iconic entrance. For me, it’s nice to be in the same place that I know my Grandma once was. I never had the opportunity to meet her. She passed before I was born. My family tells me that she was fashionable, and poised and that we would have enjoyed each other quite a bit. I have old black and white photos of her. She was always dressed to the 9’s, impeccably. Her demeanor even captured through film is lively, yet elegant, and it inspires me. Style is in my blood and my genes, and so whenever I’m doubting the direction I’m taking with my art my late grandmother is a sweet reminder that I’m following the right path. Within my blog and this post especially I’d like to pay homage to her style and grace. that’s such a sweet token you have! I love the simplicity of your blog! <3 I'm so not fashionable lol I may need to follow you!